You get in touch and we'll take it from there. We are happy to arrange an initial meeting to look over maps, leaflets and photo albums. Alternatively, we can send some sample itineraries as a start point, having established your particular interests, requirements and budget. All we need to know at this point is when you would like to travel, how many will be in your group, how much time you have available, any places you particularly want to visit and any activities you especially enjoy and want to include. Just send a message via the form (below) or phone 01242 257877. We believe that your safari begins well before you get on the aeroplane. So, before you leave, we'll send you comprehensive information about the places you will be visiting, what to pack, what animals and birds you might see, photographer's tips, souvenir-shopping advice and a reading list. 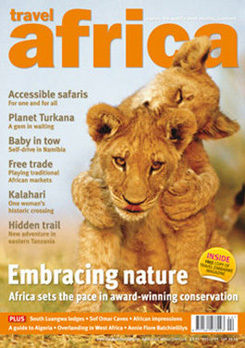 Book your safari with Simply Safaris and we will pay for a year's subscription to Travel Africa Magazine (normally £15). Published since 1997, the quarterly Travel Africa Magazine is the UK's only journal dedicated to articles and information about African travel. It contains sumptuous photos, amazing facts and quality writing in every issue from world-leading naturalists.